The traditional name of the temple complex, Chidambaram Tillai Nataraja-koothan Kovil. The mangrove forests houses the ancient Tillai trees (Exocoeria agallocha) surrounding the shrine. The Tillai trees of the nearby Pichavaram wetlands, the second largest mangrove in the world, extends to the temple area. The shrine is venerated as Tillai ambalam literally meaning the open stage of Tillai. The name of the town of this shrine, Chidambaram comes from the Tamil word Chitrambalam (also spelled Chithambalam) meaning "small hall/stage". citt or chitthu means consciousness or wisdom while and ambalam denotes the stage. As per Hindu legend, god Shiva was strolling in Thillai Vanam. In the Thillai forests resided a group of sages who believed in the supremacy of magic and that god can be controlled by rituals and mantras. Shiva wanted to test the sages and strolled in the forest with assuming the form of Bhikshatana, a simple mendicant seeking alms. He was followed by his consort, Vishnu as Mohini. The sages and their wives were enchanted by the beauty of the pair. On seeing their womenfolk enchanted, the sages got enraged and invoked scores of serpents (nāgas) by performing rituals. Shiva lifted the serpents and donned them as ornaments on his matted locks, neck and waist. Further enraged, the sages invoked a fierce tiger, whose skins and dons were used by Shiva as a shawl around his waist. Then followed a fierce elephant, which was devoured and ripped to death by Shiva (the sequence derived the name Gajasamharamurthy to Shiva). The sages gathered all their spiritual strength and invoked a powerful demon Muyalakan - a symbol of complete arrogance and ignorance. Shiva wore a gentle smile, stepped on the demon's back, immobilized him and performed the Ánanda Tandava (the dance of eternal bliss) and disclosed his true form. The sages surrendered and understood the ultimate realisation that god cannot be controlled by the rituals. There is reference to the temple or the town in Sangam literature of the first to fifth centuries and the earliest mention is found in Tamil literature. The temple and the deity were immortalized in Tamil poetry in the works of Thevaram by three poet saints belonging to the 7th century - Thirugnana Sambanthar, Thirunavukkarasar and Sundaramoorthy Nayanar. Thirugnana Sambanthar has composed two songs in praise of the temple, Thirunavukkarasar aka Appar eight songs in praise of Nataraja and Sundarar one song in praise of Nataraja. Sundarar commences his Thiruthondar Thogai (the sacred list of Lord Shiva's 63 devotees) paying his respects to the priests of the Thillai temple - "To the devotees of the priests at Thillai, I am a devotee". The works of the first three saints, the Thirumurai were stored in palm leaf manuscripts in the temple and were recovered by the Chola King Rajaraja Chola under the guidance of Nambiandarnambi. Manikkavasagar, the 10th century saivite poet has written two works, the first called Tiruvasakam (The sacred utterances) which largely has been sung in Chidambaram and the Thiruchitrambalakkovaiyar (aka Thirukovaiyar), which has been sung entirely in the temple. Manikkavasagar is said to have attained spiritual bliss at Chidambaram. The Chidambaram Mahatmiyam composed during the 12th century provides the subsequent evolution and sanskritization of cults. There are several inscriptions available in the temple and referring to the Chidambaram temple in neighbouring areas. Most inscriptions available pertain to the periods of Cholas - Rajaraja Chola I (985-1014 CE), Rajendra Chola I (1012-1044 CE), Kulothunga Chola I (1070-1120 CE), Vikrama Chola (1118-1135 CE), Rajadhiraja Chola II (1163 -1178 CE), Kulothunga Chola III (1178-1218 CE) and Rajaraja Chola III (1216-1256 CE). Pandya inscriptions date from Thribhuvana Chakravarthi Veerapandiyan, Jataavarman Thribhuvana Chakravarthi Sundarapaandiyan (1251-1268 CE) and Maaravarman Thribhuvana Chakravarthi Veerakeralanaagiya Kulashekara Pandiyan (1268-1308 CE). Pallava inscriptions are available for king Avani Aala Pirandhaan Ko-pperum-Singha (1216-1242 CE). Vijayanagara Kings mentioned in inscriptions are Veeraprathaapa Kiruttina Theva Mahaaraayar (1509-1529 CE), Veeraprathaapa Venkata Deva Mahaaraayar, Sri Ranga Theva Mahaaraayar, Atchyutha Deva Mahaaraayar (1529-1542 CE) and Veera Bhooopathiraayar. One of the inscriptions from the descendant of Cheramaan Perumal Nayanar, Ramavarma Maharaja has been found. Chidambaram is located at 11.39°N 79.69°E﻿ / 11.39; 79.69. The town is located in Cuddalore district of the South Indian state, Tamil Nadu, at a distance 215 km from Chennai. Chidambaram is located close to the shores of Bay of Bengal. The topography is almost plain with forests around the town, with no major geological formation. There are no notable mineral resources available in and around the town. The soil types are alluvial and red that are conducive for crops like paddy, pulses and chili peppers. The temperature ranges from a maximum of 32.7 °C (90.9 °F) to a minimum of 24 °C (75 °F). Like the rest of the state, April to June are the hottest months and December to January are the coldest. Chidambaram receives an average of 10 mm (0.39 in) annually, which is lesser than the state average of 1,008 mm (39.7 in). The South west monsoon, with an onset in June and lasting up to August, brings scanty rainfall. Bulk of the rainfall is received during the North East monsoon in the months of October, November and December. The average number of rainy days ranges from 35-40 every year. The temple complex is spread over an area of 40 acres (160,000 m2) in the heart of the city. The main complex is dedicated to Shiva Nataraja and the complex contains shrines to deities such as Shivakami Amman, Ganesh, Murugan and Vishnu in the form Govindaraja Perumal. The temple's earliest structures were designed and erected by ancient craftsmen called Perumtaccan. The golden tiled roof for the Chit Ambalam (the vimanam) was laid by the Chola King Parantaka I(907-950 CE) following which he was given the title "Thillaiyambalathhukku pon koorai veiyntha the van", meaning the one who constructed the golden roof. Kings Rajaraja Chola I (reign 985-1014 A.D.) and Kulothunga Chola I (1070-1120 A.D.) made significant donations to the temple. Gold and riches to the temple were donated by Rajaraja Chola's daughter Kundavai II while Chola king Vikrama Chola (1118-1135 A.D.) made donations for the conduct of the daily rituals. 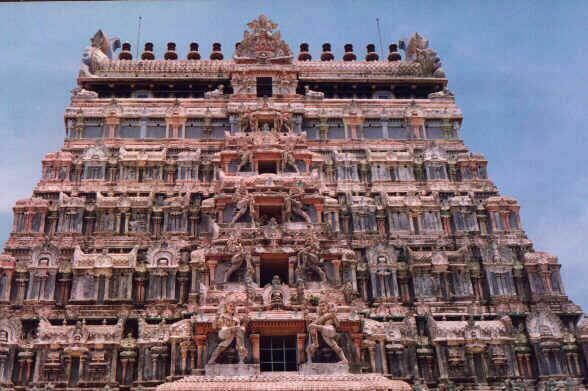 Donations of gold and jewels have been made by various kings, rulers and patrons to the temple from 9th to 16th century - including the Maharaja of Pudukottai, Sethupathy (the emerald jewel still adorns the deity) and the British. Naralokaviran, the General of king Kulothunga Chola I was responsible for building a shrine for child saint Thirugnana Sambanthar and installed a metal image inside it. He constructed a hall for recitation of Tevaram hymns and engraved the hymns in copper plates. Pancha Bhoota Stalam refers to the five Shiva temples, each representing the manifestation of the five prime elements of nature - land, water, air, sky, fire. Pancha indicates five, Bhoota means elements and Stala means place. 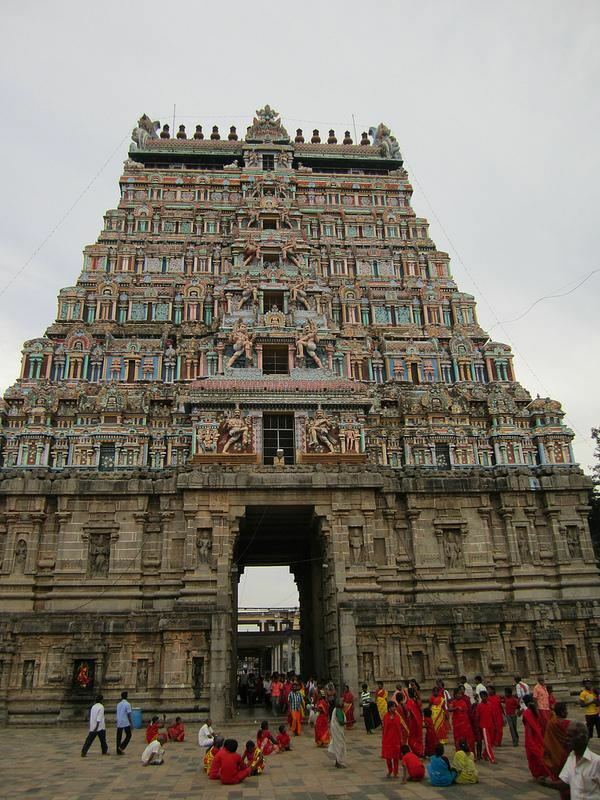 All these temples are located in South India with four of these temples at Tamil Nadu and one at Andhra Pradesh. The five elements are believed to be enshrined in the five lingams and each of the lingams representing Shiva in the temple have five different names based on the elements they represent. 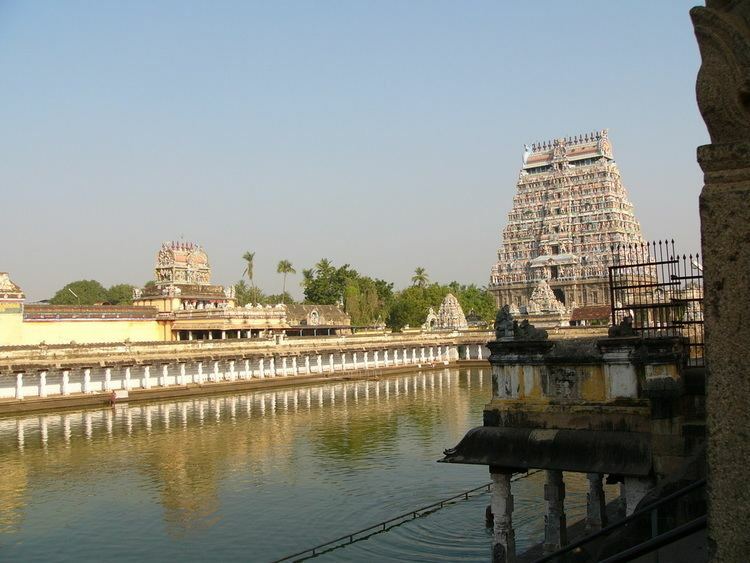 In the Chidambaram temple, Shiva is said to have manifested himself in the form of sky. The other four manifestations are Prithivi Lingam (representing land) at Ekambareswarar Temple, Appu Lingam (representing Water) at Thiruvanaikaval, Agni Lingam (representing fire) at Annamalaiyar Temple and Vayu Lingam (representing air) at Srikalahasti Temple. Aathara Stala indicates the Shiva temples which are considered to be divine impersonification of Tantric chakras associated with human anatomy. Nataraja temple is called the Anthaga stalam associated with Anthagam - the third eye. Pancha Sabhai refers to the five places where Lord Shiva is said to have displayed His cosmic dance and all these places have stages or ambalams, also known as Sabhai. Apart from Chidambaram which has the Ponna Ambalam - the Golden Hall, the others are the I-Ratthina Ambalam - the Jeweled Hall at Thiruvaalangadu (rathinam – ruby / red jewelled), the Chitra Ambalam - the Painted Hall at Thirukutralam (chitra – painting), the Velli Ambalam - the Silver Hall at Madurai Meenakshi Amman Temple (velli – silver) and the Thaamira Ambalam - the Copper Hall at Nellaiappar Temple, Tirunelveli (Thaamiram – copper). Chidambaram is served by town bus service, which provides connectivity within the town and the suburbs. Minibus service operated by private companies cater to the local transport needs. The main bus stand is located in the heart of the town and has 46 bus bays. The Tamil Nadu State Transport Corporation operates daily services connecting various cities like Bangalore Madurai, Palani, Salem, Tindivanam, Kallakkurichi, Tiruvannamalai, Velankanni, Rameswaram, Tiruppur, Karaikudi, Sivangangai, Paramakudi, Sayalkudi, Mudukulathoor, Panruti, Vriddhachalam, Erode, Mettur, chennai, Pondicherry, Viluppuram, Tirupathur and Neyveli. with Chidambaram. The State Express Transport Corporation operates long distance buses connecting the town to important cities like Chennai, Coimbatore and Thoothukudi.Three wheelers, called autos are also a common public transport system.